Here’s the real problem: we have changed. 50 or 100 years ago, there was a small fraction of the population who were burdened with obesity. 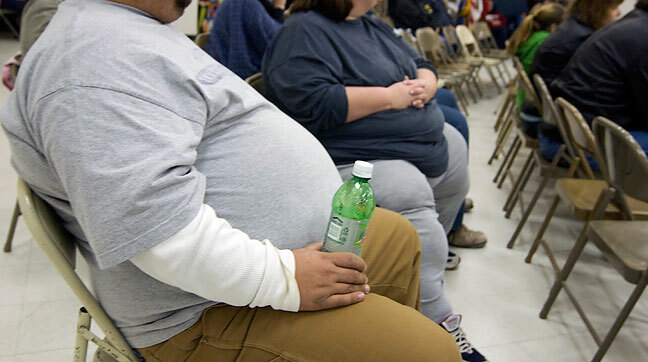 Now, there is a small fraction of of the population who are a healthy weight. In first grade classrooms. To begin to accept this as normal is dangerous. It represents acceptance of long-term disease, which in turn represents acceptance of a society and a nation that suffers from long-term disease. I’ll be unkind, and risk being labeled a bigot or bully with this statement, but: just because people are fat and want to feel good about it doesn’t mean they should. “I want to eat and sit and eat and sit. I want you to accept that I am fat.” I want. I want. I want. Asking me to accept a nation of fat people is like asking me to accept a nation of alcoholics or drug addicts. Yes, I am comparing obesity to addiction, and I’m not wrong. Fat people suckle and waddle like infants, and it profoundly injures us all. Maybe this is the Nietzsche in me, witnessing our human potential rolling around in scooters at Wal Mart. Most significantly, I don’t understand people who accept this about themselves. They choose weakness. They choose indulgence. They choose sickness. They hang their choices on excuses rolled out as reasons. And then they demand respect. Yes, as I write this, I am looking in the mirror. I like what I see, and I am not a hypocrite. If your only response to this is to stop visiting this site or lay into me in the comment section, maybe you need to look in a mirror. You’re bolder than I am. I feel and think similarly to you in this respect, but rarely open my mouth about it except to trusted, close friends, in private. On the other hand, I’ve rarely been at a weight I’m happy with. For a good 3/4 of my life, I thought myself too thin, and probably was. For the past several years, I’ve watched my weight creep up, only taking action when I approached the point of no return. I don’t accept myself at 20 lbs. past my ideal weight, so I’m certainly not going to accept others at 50 or more pounds beyond theirs. I don’t know that I’m a healthy weight. I’m skinny but my still be overweight or carrying around too much fat. Don’t know, it’s possible. There is a lot more I could be doing. BUT. I agree with almost all of this. I especially get pissed off when I go in Walmart and see people scooting around SHOPPING for CRAP on SCOOTERS. This encourages people with a problem — a health problem — to continue shopping for stuff that further ruins their health without benefit of even having to walk around the store! “Too overweight to walk? Don’t worry, Walmart will accommodate you by providing motorized vehicles.” It is total indulgence, and it’s corporate America that is doing the indulgence. Are you hungry for sugary snacks? Fine, by them, but I think corporations like Walmart should at least require people to TRY and be healthy by walking to find their items. There is a Pixar film called Wall-E that envisions a populace so overweight that all humans live on a spaceship zipping around on motorized Walmart carts, bombarded every second by corporate messages. They’re all babies; none can walk or even waddle. This is AFTER humanity has destroyed the planet with pollution and then left it all behind to rot. I do not think this is a fantasy. I think this is where we’re headed, especially after yet another mind-numbing trip to Walmart. It’s a hot-button issue for everyone. We all know someone close to us who is in the obesity downward spiral. I wish there were some way to positively encourage them to change, but they know they need to change, and don’t. We are back to choosing the easy path, the lazy path. I feel so happy when I see a fat person on a bike or the walking trail; they’re trying. I never look down on them. I think the best way to encourage any one is to say positive things and be a positive person. We all have areas to work on and I do just that I work on me. I can’t save them from them selves and have stopped trying. I give encouraging advice when asked. But I also can shoot a go to hell look with the best of them. I think that is the issue from my vantage point the looks of judgement to the a flicked just reinforces the low self esteem they already have, but the looks they remind those of us walking beside that love one the world is not a very kind place.